A. You know ... hmm ... let me think ... no, I don't want another 18 Bourne adventures, either. Q. Regarding your review of "Flash of Genius," do you really think conservatives favor an enterprising capitalist like Robert Kearns getting his invention stolen? Conservatives have historically and fiercely stood for the defense of property rights, including intellectual property. The Ford Co. broke the law. I challenge you to find a conservative who sides with them on this issue. You stated you sounded "just like a liberal" in your championing of Kearns against the mighty Ford. I disagree. If, however, after he won his lawsuit and received $30 million, you would vilify Kearns as a rich, selfish fat-cat who wasn't paying his fair share in taxes, then you would sound just like a liberal! Bill Smith, Litchfield Park, Ariz.
A. Naw. Kearns fought 14 years for that verdict. He deserves it. A lot of CEOs make $30 million in one day. Oct. 3, 2008, for example. Q. Thank you for giving "The Godfather, Part II" another look. I was never offended by your 1974 review of Part II. Although I think the film is great, I feel that the first picture is better, flows more smoothly and has better pacing. The writing of the original doesn't get confusing like Part II. Still, Part II is a wonderful, important film. I've been waiting for you to add it to your Great Movies section. It is a film that millions have loved for years. I am surprised you took the time to see it, think about it and write about it. I thought maybe you had decided to never see it again. The thought of you disowning or ignoring a film that many believe to be a cinematic miracle was confusing and kind of frustrating. It certainly does not bother me that your opinion has not changed and that you do not regret your original review. What is important is that you gave it another chance. As a film lover, that means a lot to me. Christopher Zeidel, San Luis Obispo, Calif.
A. Hey, my feelings for "Part II" don't mean I wouldn't rather see it again right now than 95 percent of ... you get the idea. Maybe 96 percent. A. I am especially in favor of option No 2. I hope they also encourage cell phone use. Q. Anyone who sees Bill Maher's "Religulous" needs to understand his comedy: He doesn't merely tell jokes, he offends and then watches the person die (close to Mel Brooks' definition of comedy). Know this and you'll enjoy the film, as I did. (I'm a Christian, by the way, and therefore a part of the problem.) My favorite moment of "comedy" is when Maher himself was clearly offended and speechless after failing to get more than a few words in with the rabbi who kept talking over the crew to explain why he sides with the extermination of his own race. No, he doesn't explain himself, and much less does he make sense; but Maher showed his Jewish heritage and his outrage, to the extent that he fails to give the viewer an unedited cut of the scene. Maher also demonstrates that he can't take what he dishes out (and he's always been this way on television: He can anger anyone he pleases, but when someone offends him, look out). This is the highest brand of comedy in contemporary film today; it's something that's always bothered me about him and is something that makes him worth watching at the same time. John Joachim, Noblesville, Ind. A. Uh, I'm not sure the rabbi was joking. I agree Maher would rather die than appear on camera as speechless. That rabbi was a case study. And where did Maher find those jolly Vatican priests, who chuckled while pooh-poohing so many of the sins I spent my youth convinced would send me to hell? A. As a matter of fact, I did. "The Prince of Darkness" himself explained it to me. 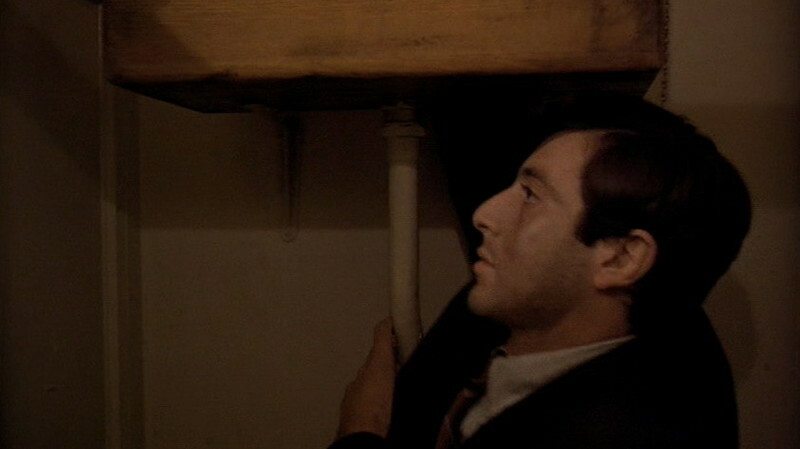 But first, let's end speculation about how Willis filmed the toilet scene in "The Godfather" (was it shot on a set, or in an incredibly crowded real toilet?). He says, "It was the bathroom in the restaurant. Just had the operator and assistant stuffed into a corner; shot with an Arriflex." As for how he could keep a forward move always in focus in "All the President's Men," he explains: "I designed a piece of equipment to permit the use of sliding diopters on a moving camera or a zoom shot, to maintain selective focus front to back. The unit was used frequently on "All the President's Men," which it was designed for. Up until this point, diopters were used to split focus on set shots only. I had a custom set of splits [diopters] made for use in the unit. Panavision was kind enough to build the piece." "Note: A diopter is an additional element used partially in front of a standard lens," Willis said. "This permits deeper depth of field (more selective focus front to back). They are usually made as half round in shape and are formulated in varying degrees of strength. "They can be placed at any angle in front of the primary lens," Willis said. "The trick on "All the President's Men" was the ability to move them in and out while the scene was progressing, and the camera was moving, and not see it." Next Article: Why "rent it" is terrible advice Previous Article: Drag that critic from the theater! Drag that critic from the theater!